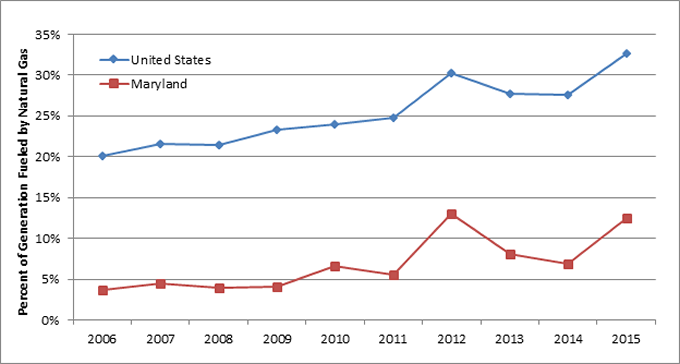 The economic recession that began in 2008 resulted in a downward trend for electricity consumption in Maryland. While Maryland was not as seriously affected by the recession as many other states, it was not immune to the higher unemployment levels and lower levels of economic activity generally. Electricity sales in 2009 were about 1 percent below 2008 levels, largely explained by the recession-induced declines in economic activity. As the economy began to recover in 2010, electricity consumption also increased in Maryland by 4.4 percent compared to 2009. However, since 2010, electricity consumption has fallen. This decline is largely due to the impact of the EmPOWER Maryland legislation. This law targeted a 15 percent reduction in per capita electricity consumption by 2015 from 2007 levels. For more information about EmPOWER Maryland, refer to Section 5.1.2. Table 2-9 compares the average change in electricity consumption by sector for both the United States and Maryland from 2013 through 2015. Recent reductions in electricity consumption in Maryland have been outpacing those in the United States across all non-residential sectors. 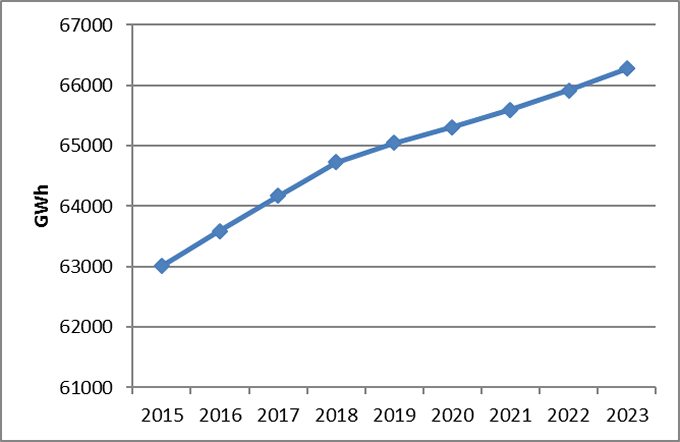 Figure 2-20 illustrates the most recent forecast for future electricity consumption in Maryland, as projected by the utilities serving loads in the state. The growth rate in electricity consumption in Maryland averages about 0.6 percent per year over the 10-year forecast period. By comparison, the average annual growth rate in electricity consumption in Maryland was around 2 percent during the 1990s, but less than 1 percent between 2000 and 2010. The slower growth in recent and forecasted electricity consumption compared to historical growth during the 1990s is largely attributable to increases in the real price of electricity, slower growth in population and employment, and the impacts of EmPOWER Maryland. Higher electricity prices dampen the demand for electric power in two ways. First, the existing stock of electricity-consuming equipment and appliances is used less intensively because operation is more costly. Second, the stock of electricity-consuming equipment and appliances is replaced over time with equipment and appliances that are more energy-efficient. PJM produces an independent forecast of electric energy consumption, and PJM’s most recent forecast covers the 15-year forecast period of 2016 through 2031. The relatively slow growth in electricity consumption in Maryland is projected by PJM to persist throughout the PJM 15-year forecast period. Over this period, consumption is expected to grow at an average annual rate of approximately 0.4 percent, which is slightly below the 0.6 percent average annual rate of growth over the 10-year period ending in 2023, as forecasted by the Maryland utilities. Future electricity prices (and hence consumption of electricity) are affected by wholesale natural gas prices, in addition to a range of other factors. Wholesale natural gas futures contracts priced on the New York Mercantile Exchange (NYMEX) are based on the delivery price at the Henry Hub in Erath, Louisiana. Henry Hub is a major intersection of pipelines and the crossroads for a significant amount of natural gas moving to locations across the country. Wholesale natural gas is priced and traded at over 30 hubs throughout the country where major pipelines intersect. The difference between the Henry Hub price and another hub is based on supply and demand at that particular point. As shown in Figure 2-21, natural gas prices between 2005 and 2008 peaked near $13 per million British thermal units (MMBtu). In late 2008, natural gas prices began to drop. By mid-2009, wholesale natural gas prices were below $4.00 per MMBtu, compared with prices in mid-2008. Abundant natural gas supplies resulting from shale gas and an abnormally warm winter allowed wholesale prices to drop below $2.00 per MMBtu in 2012. Prices recovered in 2013, averaging between $3.50 and $4.50 per MMBtu, as the excess supply of natural gas in the market returned closer to 5-year average levels. However, in 2014, the Polar Vortex caused high demand and resulted in significant declines in gas storage levels which caused prices to spike to $6.00 per MMBtu (see Section 2.1.4, Demand Response, for more information on the Polar Vortex). As storage levels normalized throughout 2014, the price decreased to under $3.00 per MMBtu by 2015. Source: Historical prices: U.S. Energy Information Administration; futures prices: The CME Group. As is shown in Figure 2-22, natural gas has been steadily growing as a share of fuels used for electricity generation in the United States. In 2012, the proportion of electricity generated from natural gas increased significantly in both the United States and Maryland, owing primarily to fuel switching and natural gas generating facilities operating for more hours of the year. Natural gas futures show that wholesale natural gas prices may remain below $4.00 per MMBtu through 2018 or longer due to abundant supplies of shale gas (see Figure 2-21). Therefore, since natural gas-fired facilities are often the marginal resources within the PJM Interconnection region, and therefore often set the spot market prices in PJM, electricity prices are anticipated to show only modest increases through 2018. Refer to Chapter 3 for more information on natural gas and electricity markets. In addition to economic factors and EmPOWER legislation, future electricity consumption may be affected by additional energy conservation, fuel switching, and distributed generation. For example, achievement of the 2015 EmPOWER Maryland goals resulted in much of the State’s street lighting inventory being upgraded. The Maryland DNR also published the Long-Term Electricity Report for Maryland (LTER) in 2011, which examines various approaches to meeting Maryland’s long-term electricity needs through 2030 and provides another tool to examine future electricity consumption. The assessment considers how environmental regulation, land-use restrictions, and the transmission infrastructure affect energy and capacity costs, fuel use, fuel diversity, emissions, power plant construction and retirements, and renewable energy credit prices. The LTER Reference Case, which represented then-current regulatory and economic conditions, was developed to evaluate load levels and fuel prices based on projections assessed to be most plausible. A total of approximately 40 alternative scenarios were also assessed to evaluate potential impacts of changes in legislation, fuel prices, load growth, power plant construction, and various other factors. The LTER is a useful sensitivity analysis tool that can be used to evaluate current conditions compared to the Reference Case and how any differences may affect future electricity needs in Maryland going forward. A major update to the Reference Case, as well as alternative scenarios, is scheduled to be released in December 2016. PJM, “Analysis of Operational Events and Market Impacts During the January 2014 Cold Weather Events,” May 8, 2014, http://www.pjm.com/~/media/library/reports-notices/weather-related/20140509-analysis-of-operational-events-and-market-impacts-during-the-jan-2014-cold-weather-events.ashx (Download Adobe Acrobat Reader).